Hall Construction is an established family business located in Hampton Roads, Virginia. We specialize in fire, water, and storm damage restoration for your home or business. Our company stays up to date with the latest practices and standards, ensuring that our customers receive the most professional service. 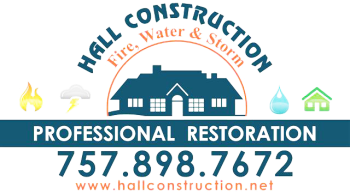 Hall construction provides its professional restoration and general contracting services throughout Hampton Roads, Virginia.